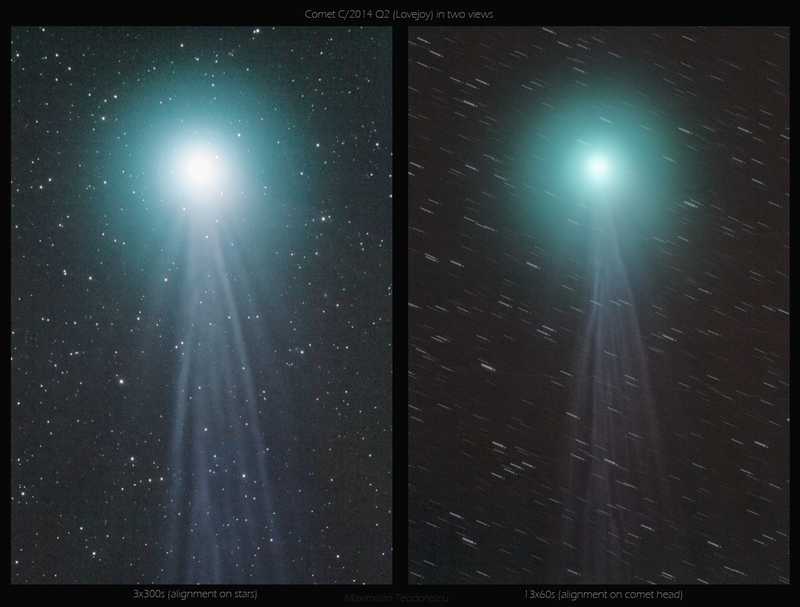 I’ve finally finished processing all of the images from the January 16-18 weekend of comet Lovejoy, from the Cota 1000 site. The following images are the results from the second night (Jan 17-18), acquired with the TS 65Q APO Refractor (65 mm diameter, 420 mm focal length) and Canon 550D with guiding via PHD software onto the NEQ6 mount. The base result is a stack of 15 frames at ISO 800 and 1600, and exposures of 4 minutes. -the same as the previous, but inverted, again to better see the details in the tail. 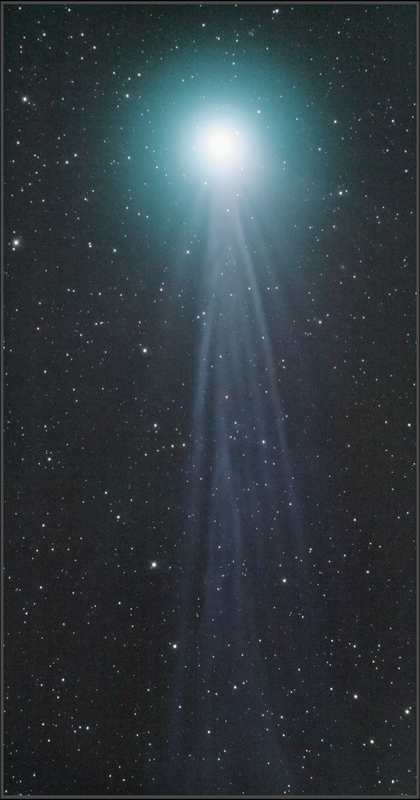 Hope I’ll get another personal view of Lovejoy soon. Despite the fact that the following images have been acquired on the same date as the ones in the previous post, I will present them in a new one, since the acquisition and processing were done in a totally different manner. The frames were acquired with an 8″ F/5 Newtonian telescope equipped with a Baader MPCC (coma corrector), and the trusty Canon 550D at ISO 800 and 1600. The setup was mounted onto an EQ6 equatorial mount, and guiding was done via a 50 mm F/4 finder scope with Meade DSI I camera and PHD software. 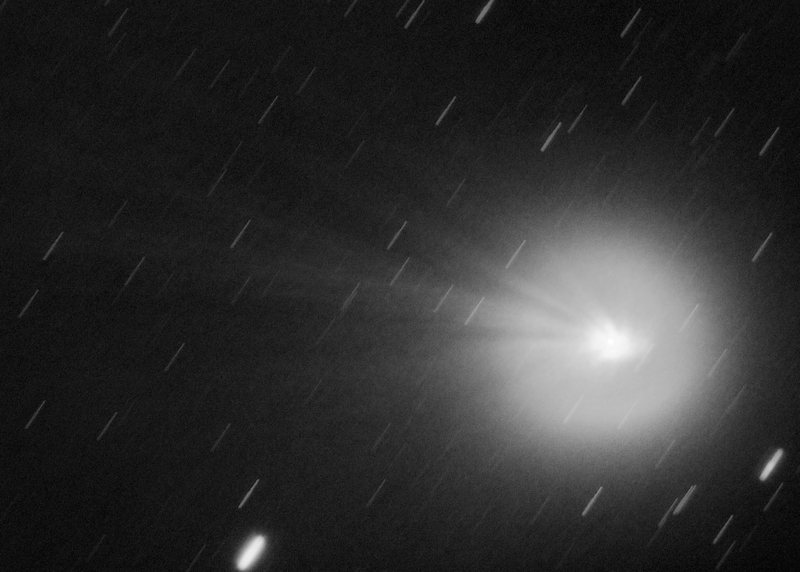 I will start with a wider image showing some of the inner part of the comet’s tail. The image is a two-panel mosaic, each a 3×5 minute exposures at ISO800. And a four-panel mosaic, each panel made from a single frame shot at ISO800 for 5 minutes. 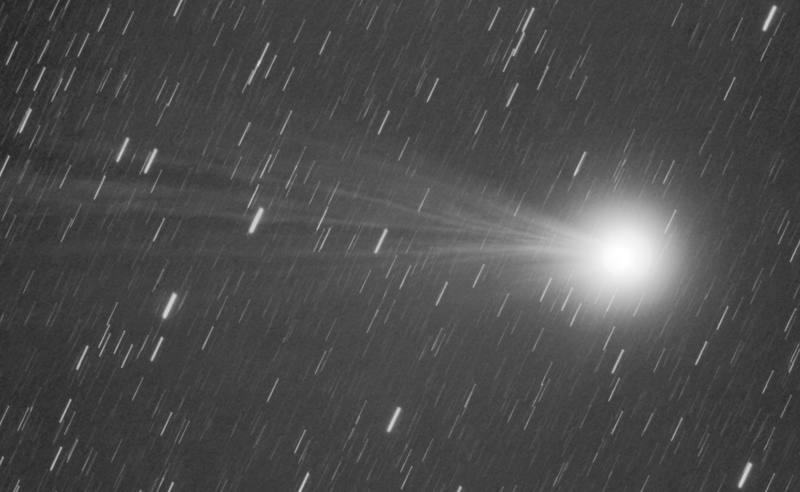 The next images show an even smaller part of the tail, but this time the acquisition was a bit different: 13 frames, each a 1 minute exposure at ISO1600, were stacked using the nucleus as the alignment point. 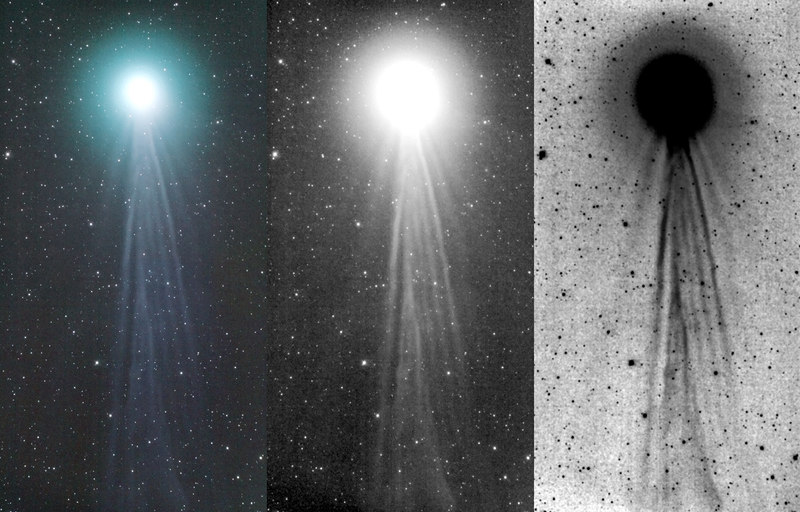 The image shows the delicate filament-like jets of dust and gas. 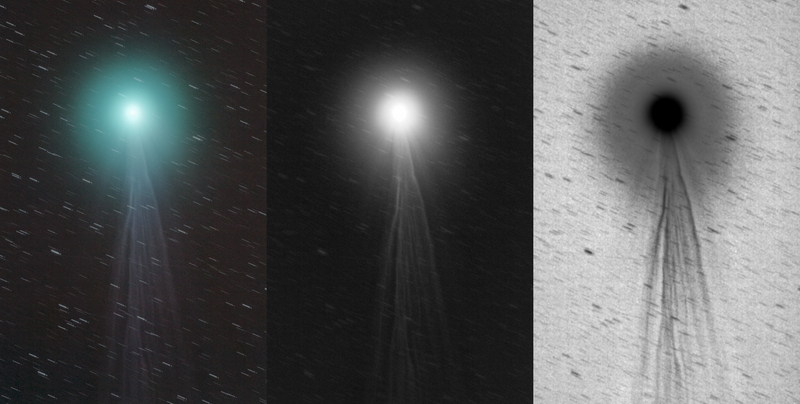 The jellyfish aspect of the comet is even better seen in the following sequence, presenting one more processing mode (with less stars), and the corresponding negative version. 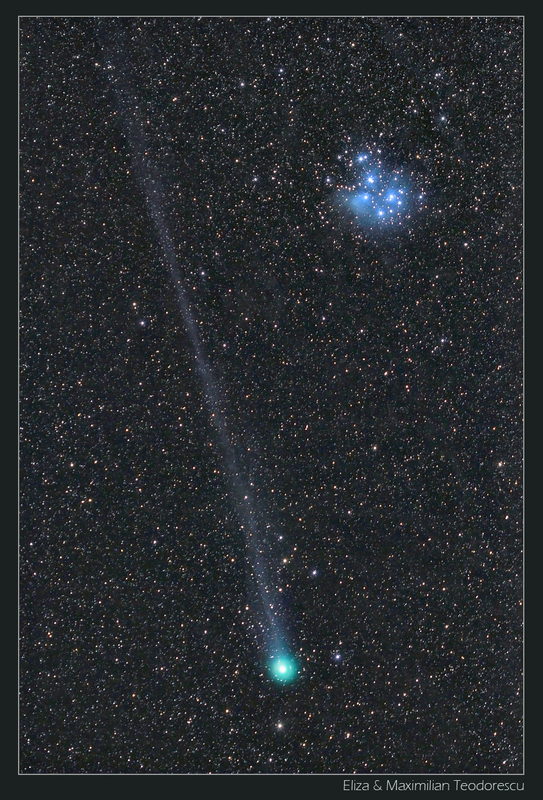 It can be easily observed that despite the brighter appearance of the image at left, and the pinpoint stars (and also some galaxies), the finer details in the comet’s tail are washed out due to the longer exposure time (5 minutes for each of the three frames) which meant that the comet moved a lot among the stars. 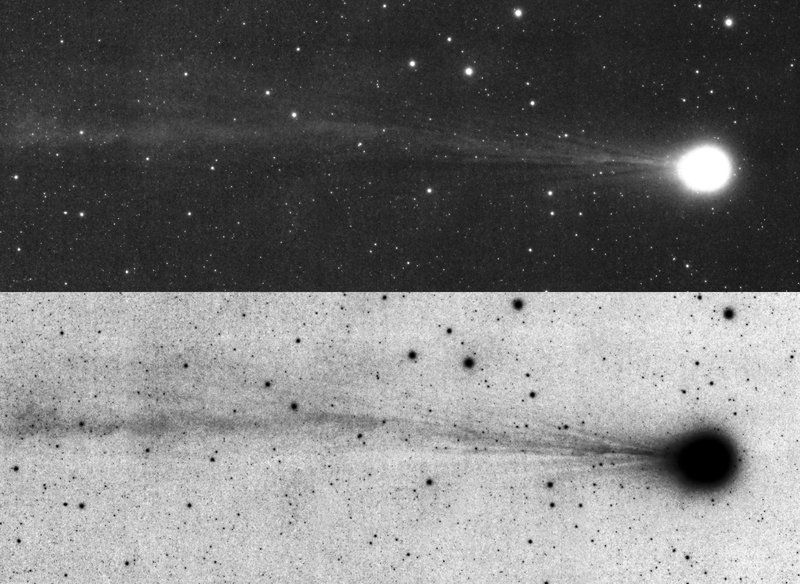 This is not true for the second image, where the 1 minute exposures captured only a small movement of the comet, so the finer details remained better resolved. 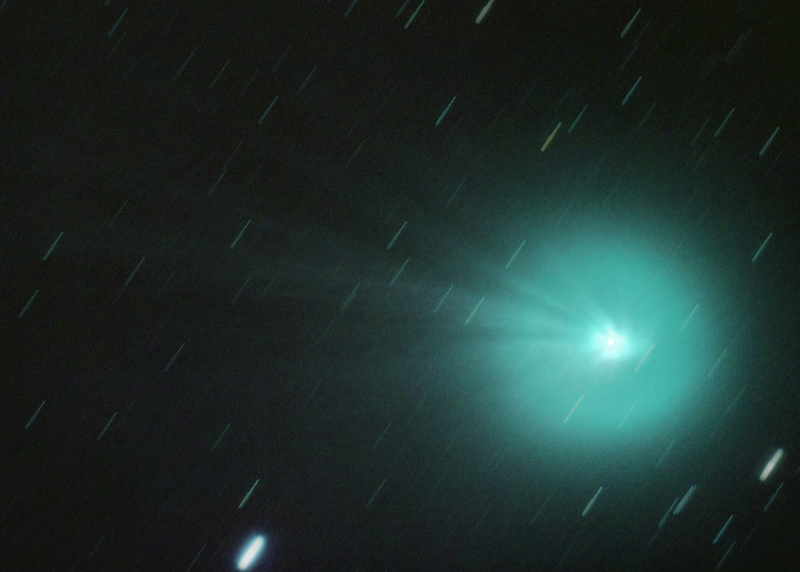 Some small galaxies cam be discern near the comet’s coma. 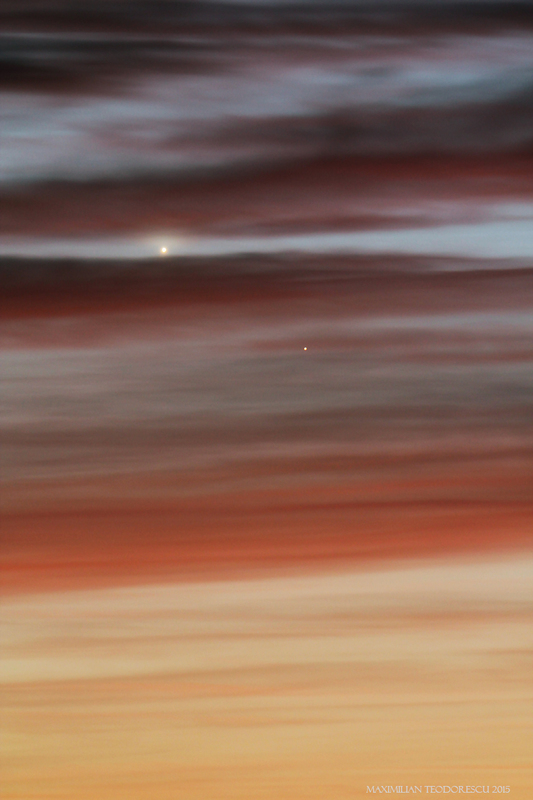 Still, a truly correct image showing the smallest details could be acquired with only very few short-time exposures, but this also requires a large diameter short-focal scope, and of course…perfect skies. 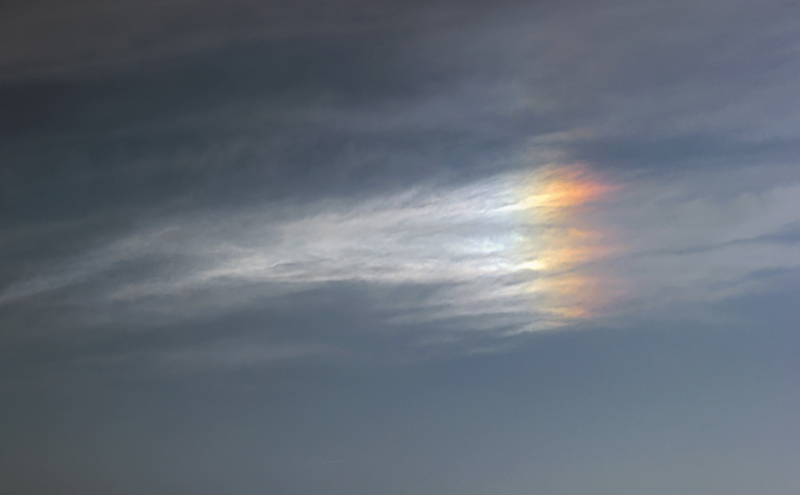 Too bad the skies did not cooperate this time…It would have resulted in a nicer and perhaps longer tail-panorama, and also a longer and better animation. 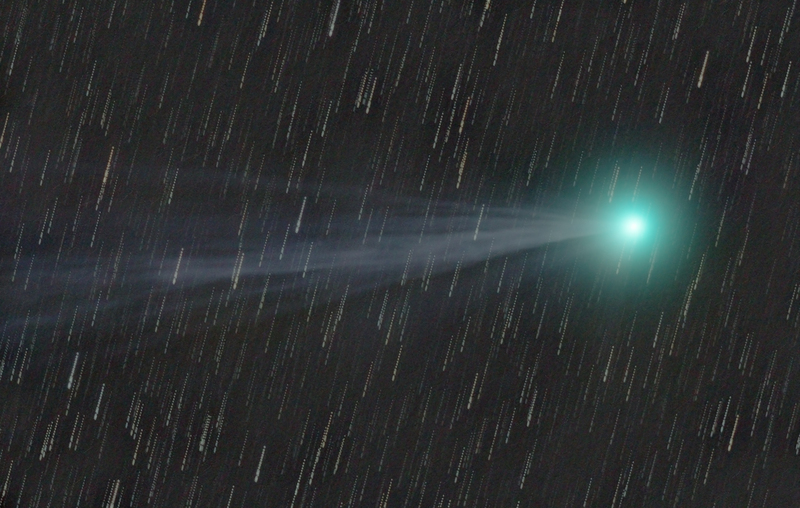 For this last weekend I had a great plan: two trips to Cota 1000 (Sinaia) for catching comet Lovejoy near the Pleiades star cluster. 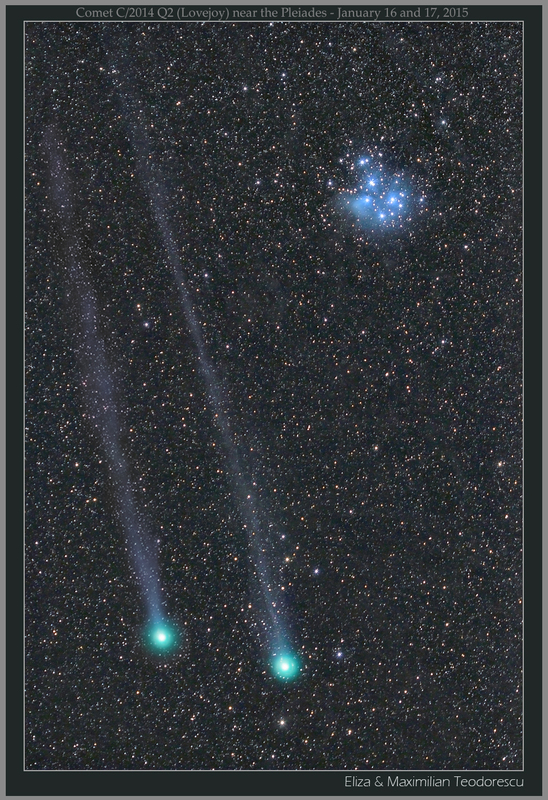 The equipment that myself and my wife had with us was quite enough for catching either the comet and M45 (the Pleiades) or the very-long tail of the comet. Despite our best hopes, the transparency at an elevation of 1000 meters was quite poor (3-4/5) with the Milky Way visible only around 2/3 of the entire length above the horizon, and the comet’s coma almost at the limit of naked-eye visibility. For now, only some of the images are processed, with the ones with better tail detail still in the processing stage. The more artistic shots are a two-man’s job, with my wife acquiring the images and myself processing them. Her equipment: Canon 550D at ISO1600 and Canon 100mm Lens at F/3.5. Only 15x180s frames were stacked, out of 23-24 for each night. Unfortunately we had to go back home the third day. Otherwise we could have got a third position of the comet, much closer to the Pleiades. 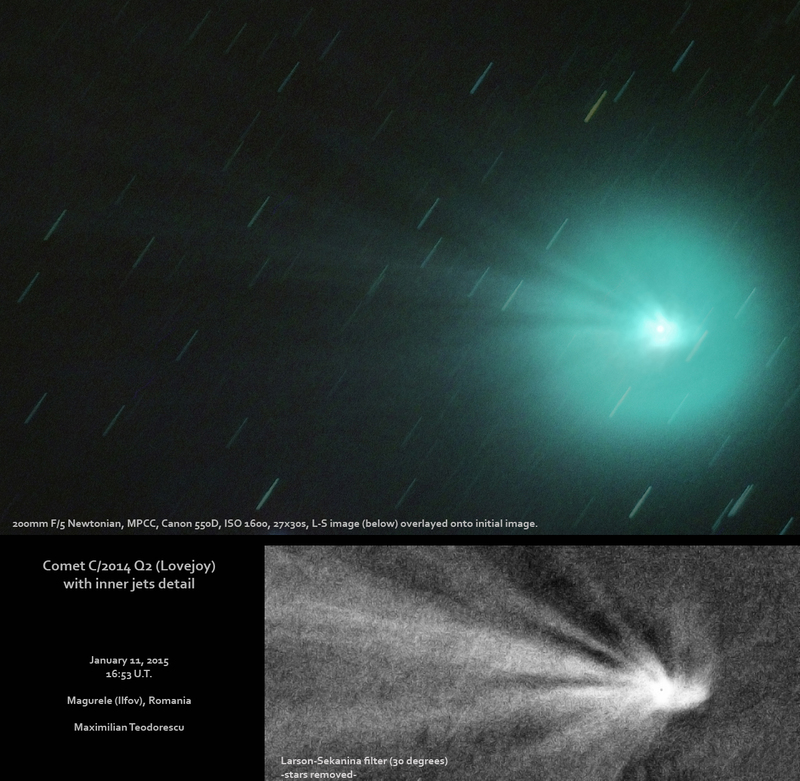 I will continue the work on the other comet images, and soon they will be posted here. 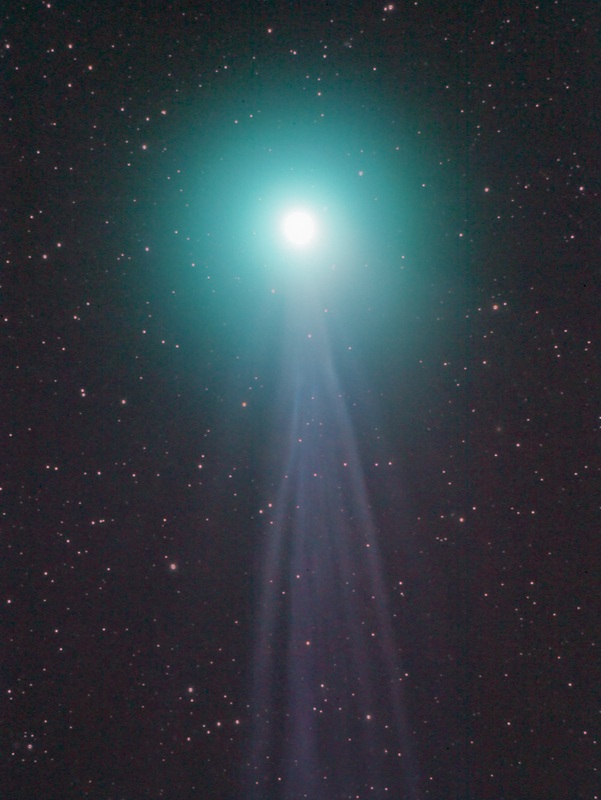 Another imaging session with Lovejoy, this time from January 12, again from the Comana Woods. The imaging setup was the TS 65Q APO Refractor and the Canon 550D at ISO 800 and 4 minutes for each of the 14 exposures. The sky conditions were not great, with a lot of humidity in the atmosphere, and light pollution. The length of the tail is also very impressive. The following image is a two-frame mosaic, each a 5 minute exposure at ISO 800. I’m still waiting for a true dark sky up in the mountains to better catch the superb tail of the comet. 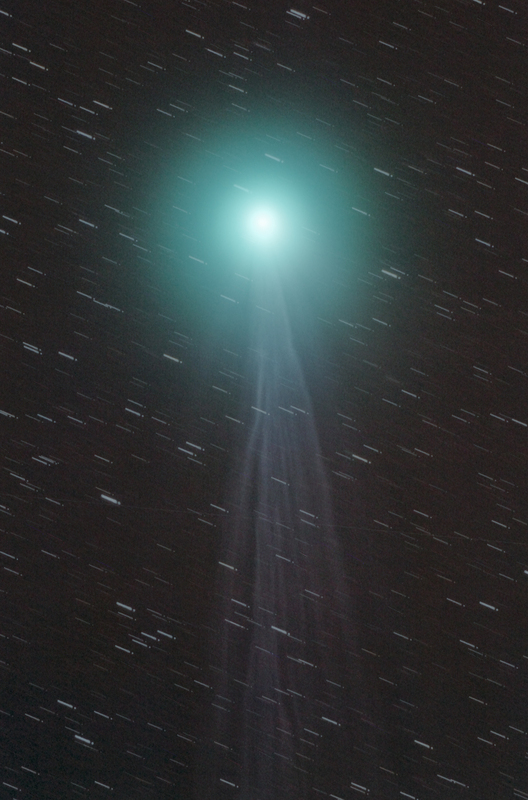 Another imaging run with Lovejoy under the darker skies of the Comana Woods. Darker compared to my closer-to-home observing location, but far from the true dark skies up in the mountains. 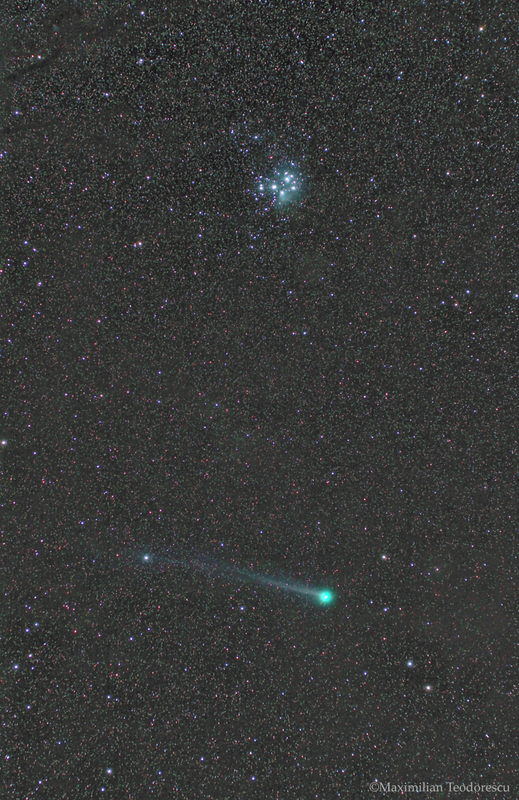 This time, besides the “normal” image acquired with the TS APO 65Q, I’ve also shot a wide-field image showing both the comet and the open cluster M45 in the same field. 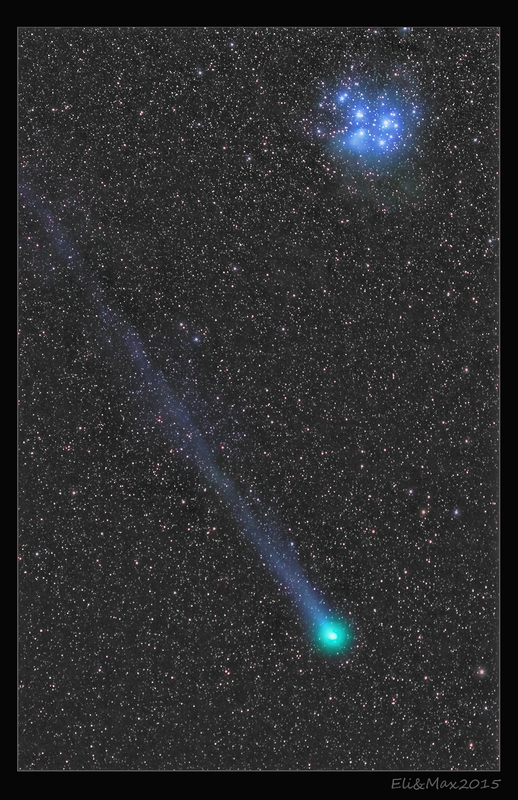 The tail of the comet is quite long now. The image above is a 9-frame stack, each a 4 minute exposure at ISO800 with the Canon 550D and a Sigma 50mm Macro lens at F/4, all on the EQ6 mount. And the “normal” shot using the TS 65Q APO Refractor (D=65mm, F=420mm) and the Canon 550D at ISO800 and 1600, with PHD-assisted guiding, 15 frames with exposures from 240 to 300 seconds. 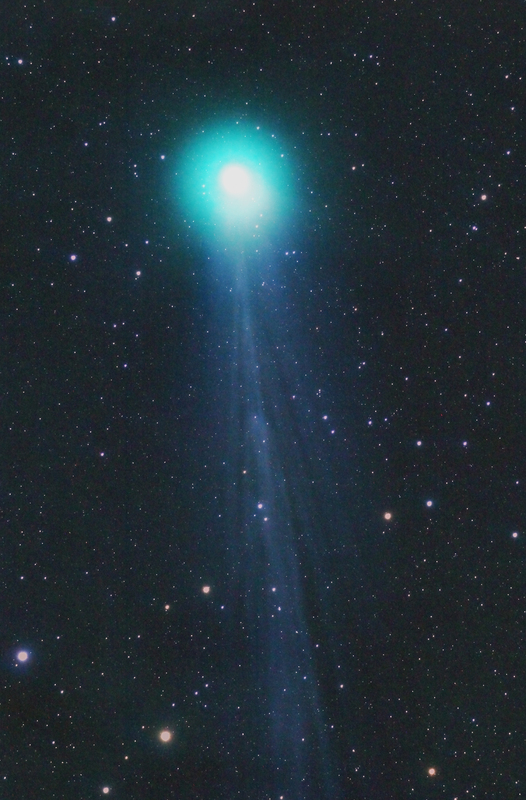 The tail of the comet seems to get brighter. I have another planned session for tonight, so perhaps better images are going to be posted here. 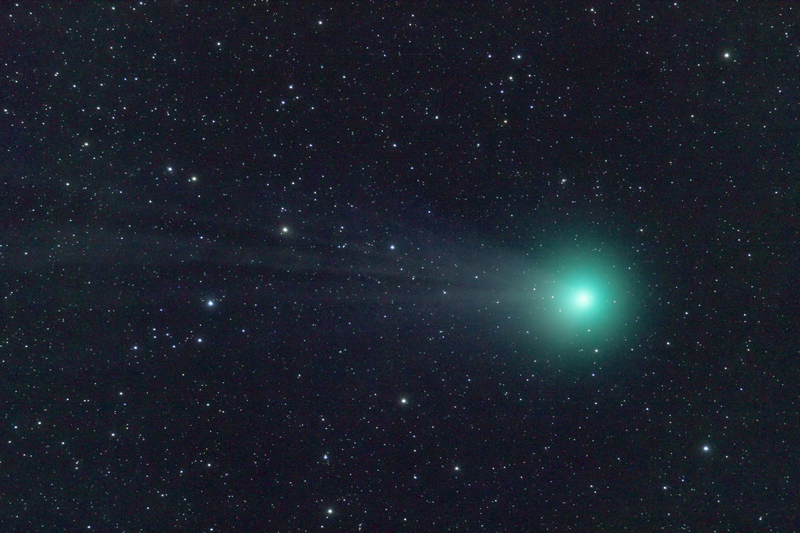 While testing my old 8″ F/5 Newtonian’s new look (meaning a lot of modifications) together with my wife, I got a brief chance at observing and imaging comet C/2014 Q2 (Lovejoy) just before the clouds rolled in. 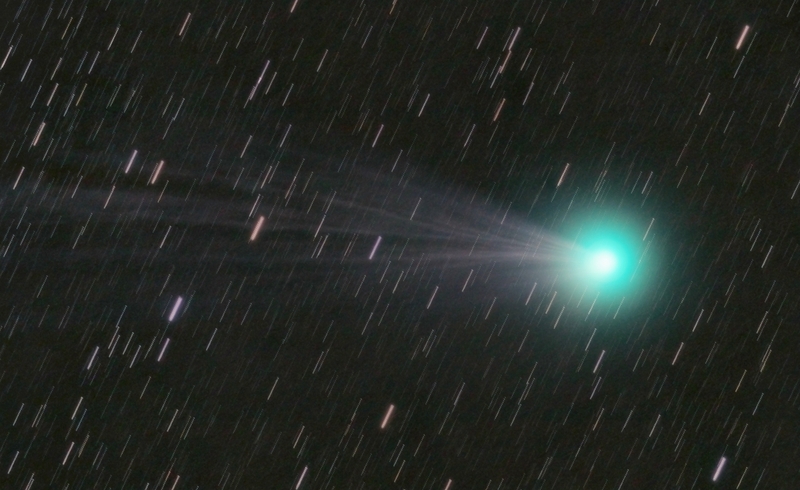 This time, since I was not very far from home (just 5km South), and that usually means a lot of light pollution, I could only image the inner tail of the comet and the general aspect of the coma, so no long-time exposures. But, since I’ve wanted to get the best out of the images, I’ve processed and re-processed the image for a few hours (around 3) and got a view showing the some of the inner jets present in the coma. The equipment used for this session: Homemade 200mm F/5 Newtonian with SkyWatcher optics, Baader MPCC, Canon 550D at ISO 1600, 27 frames each a 30 seconds shot. The time of acquisition was 16:30-17:10 U.T., with only some frames selected from the initial 45. The first image shows a processed image with only slightly processed inner-coma details. The details inside the coma are the result of applying the Larson-Sekanina filter with a value of 30 degrees. 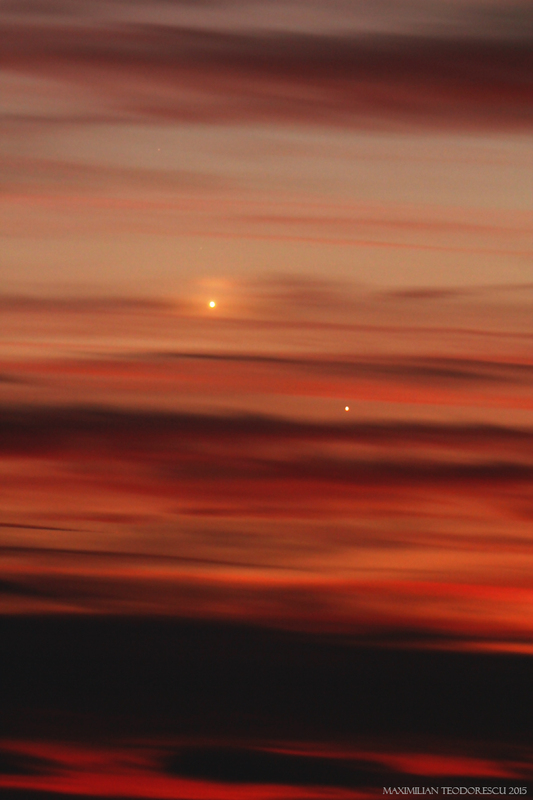 And a comparison image showing the final processed image together with the Larson-Sekanina filtered image. The L-S image was processed by removing the stars and increasing the contrast. The L-S inset is at the same scale as the final image, so a direct comparison of the actual filaments present in the inner coma is possible. 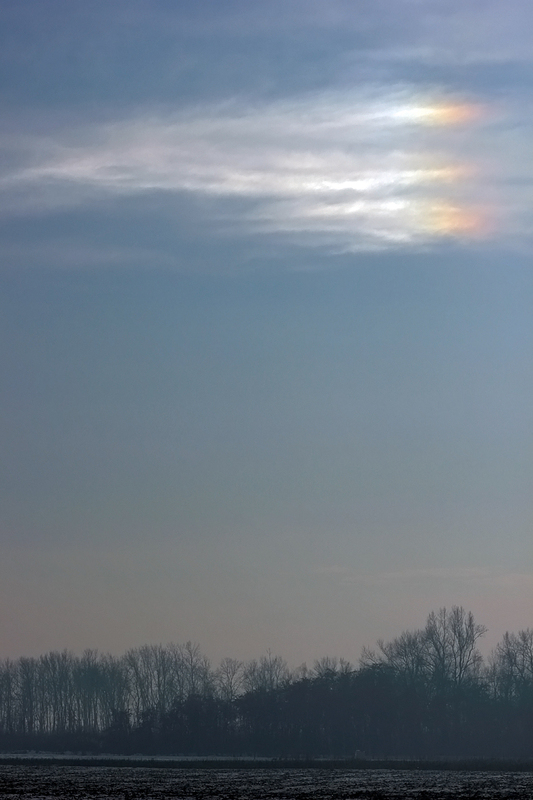 Very soon I will be again under the darker Comana Skies, so hopefully better images will be posted on this blog. 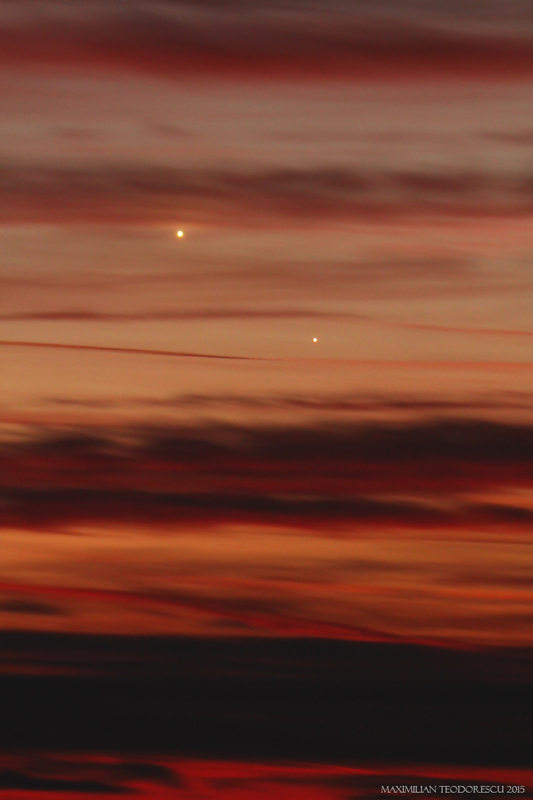 Just I was giving up with shooting the close encounter between the inner planets due to the dense front of clouds, a large clearing at the western horizon made me hope for a possible chance of still seeing the event. 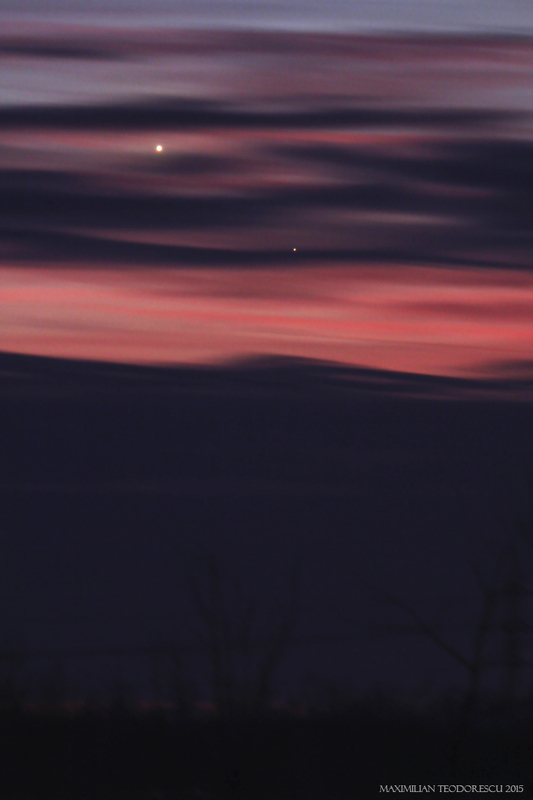 Driving just a few kilometers south from my home, into a large field, I got the chance I was hoping for: the two planets shinned just above the horizon, in between the clouds. The following images were acquired with the TS 65Q APO refractor (65mm, F/6.5) and Canon 550D at ISO400, with exposure times ranging from 2 to 10 seconds.